Dancing to Street Beats on the corner of Florence and Crenshaw. 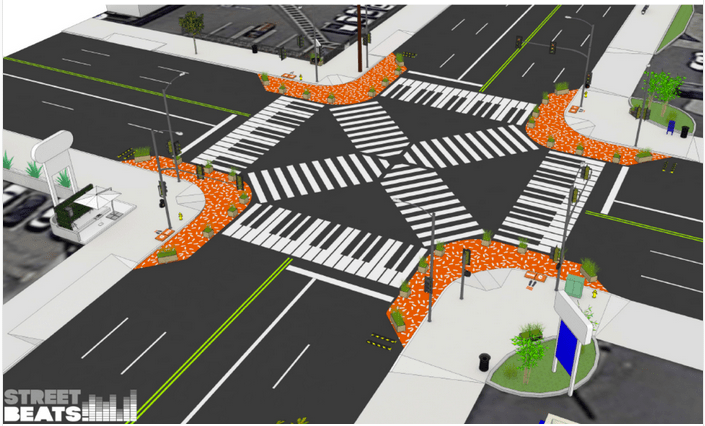 Sahra Sulaiman/Streetsblog L.A.
Last week, the Street Beats team converted the extremely busy and often dangerous intersection of Crenshaw and Florence into a play zone. With the help of a grant from the Mayor’s Great Streets program and countless extra hours over several months dedicated to pounding the pavement, knocking on doors, and building relationships with local artists, community advocates, neighborhood block clubs, churches, and other stakeholders, the folks at Studio MMD, Ride On! Bike Co-op, Community Health Councils, and TRUST South L.A. managed to bring the neighborhood out to spend the day at a corner most of us would rather hurry through. The idea was to engage Hyde Park neighbors on the kinds of street interventions that could help improve the safety of those that move through the intersection — be it on foot, by bike, by bus, or in a car. Using do-it-yourself bump-outs and a scramble crosswalk, they hoped to demonstrate just how much a simple design intervention could positively impact the way traffic flowed through a crossing, making it safer for all users. A woman eyes up the temporary scramble crosswalk that could help her navigate the intersection much more efficiently than she normally would be able to–something that is particularly appealing when you are carrying a lot of stuff with you or have young kids in tow. Sahra Sulaiman/Streetsblog L.A. But, as Studio MMD’s Michael MacDonald told me back when they first took on the project — people are not all that likely to come out to an inhospitable street corner on a Saturday just to talk street engineering and bump-outs. Even ones as bright and fun as they envisioned (below). The rendering of the transformed intersection by Studio MMD. And really, why would you want to put so much effort into bringing people together just to talk bump-outs? 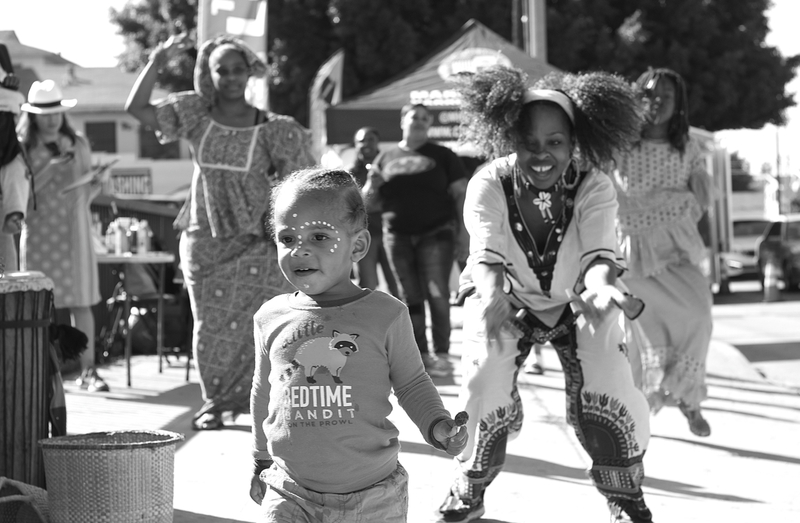 But to open that door in the first place, they knew they would need to work with a wide range of stakeholders to make the project feel community-driven and celebratory of the area’s culture. 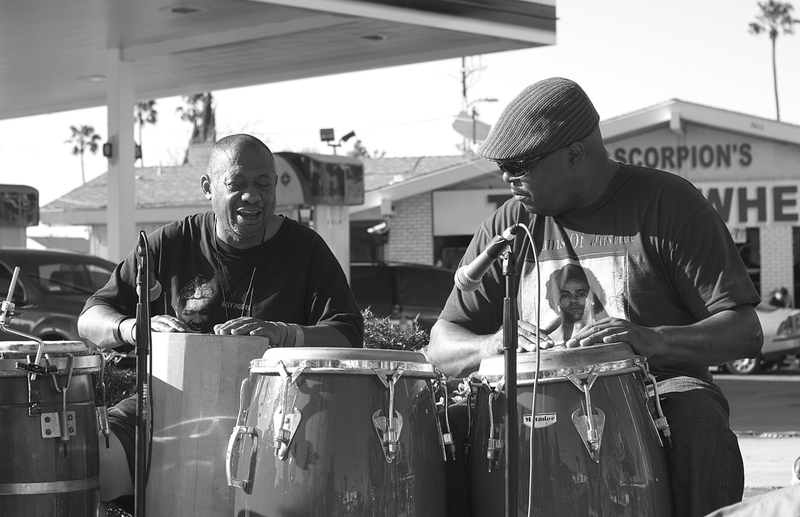 Tapping into the rich history of music and arts in the area, they designed the crosswalks to look like keyboards and recruited local drummers, other musicians, artists with a long history in the community, and DJs to fill each of the corners with art and joyful noise. 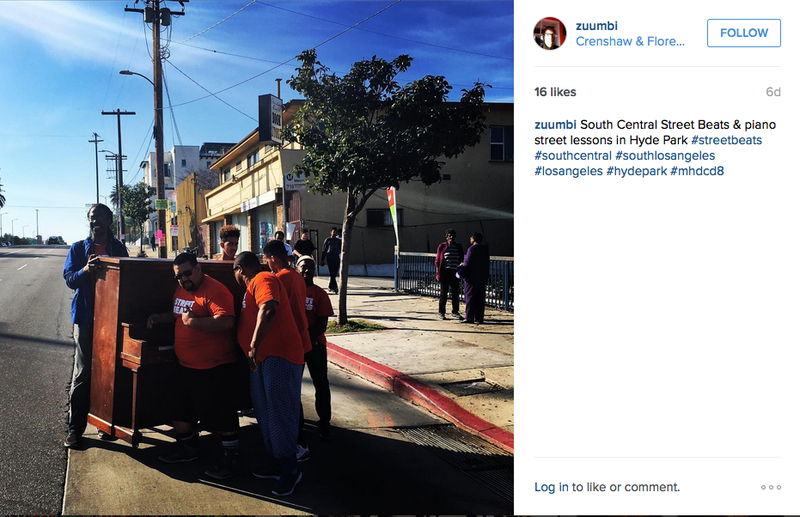 TRUST South L.A.’s Malcolm Harris captured the Street Beats team and neighborhood volunteers moving the piano to the southwest corner. The team mounted borrowed iPads loaded with custom samples and running a beats-making program to each corner’s light poles. Speakers mounted to the poles broadcast the beats across the intersection so participants on one corner could battle someone using an iPad across the way. Or inspire a spontaneous rap. Or, alternatively, they could build sound with friends who wanted to accompany them on drums (below) or an upright piano (donated by a North Long Beach church). Drumming ruled the day, drowning out traffic noise and inspiring collaboration and connection. Sahra Sulaiman/Streetsblog L.A. The vibrant colors volunteers scrambled to lay down early Saturday morning for the bump-outs drew people’s eyes to the intersection. The music gave people a reason to linger and observe how the intervention impacted driver and pedestrian behavior. But the fact that it was community members — often neighbors and friends — who were helping run the event, capture residents’ stories (as artist Lisa Diane Wedgeworth was), do screen printing, dance, and provide the soundtrack for the day, made people feel comfortable sticking around to talk about the state of the intersection as well as that of the larger community. By all accounts, it was a tremendous success. Some were so impressed they went home to drag neighbors and relatives to the intersection to try out the pedestrian scramble. Others wondered why we didn’t have intersection parties every weekend. Still others driving through the intersection flagged down Ride On! Bike Co-op founder Adé Neff to ask what they were doing. As he explained the objective of the bump-outs, Neff said, drivers’ confusion and frustration generally transformed into understanding and, even, gratitude. The fact that the intersection ranks as one of L.A.’s 25 most dangerous was a surprise to no one in the area, and even the drivers recognized there was room for improvements. The width of both Crenshaw and Florence encourages speed, as does the fact that northbound vehicles on Crenshaw are approaching the intersection on a sizable downhill run. So many of the people I spoke Saturday with had witnessed close calls or fatal terrible crashes there. Cars still tried to beat pedestrians through the more narrow intersections. Sahra Sulaiman/Streetsblog L.A.
And even with the intersection treatments, it was clear drivers weren’t used to giving pedestrians the right of way. Above, I caught a vehicle sneaking through in an attempt to beat pedestrians making their way through the crosswalk. It wasn’t the only time I witnessed such a maneuver. Which is why Neff sees the success of the Street Beats event as more of a “feel good” outcome and the first step in a larger process. True success, he said, would entail the permanent transformation of the intersection and a real change in the behavior around the intersection. Citing the example of an elderly woman with what appeared to be a hip injury, he said he had watched her struggle to get just halfway across the intersection only to have the light change. The width of the crossing (without the scramble or other treatments) put her in danger and backed up traffic, increasing the likelihood of a collision between drivers impatient to get around her. Permanent improvements at that site, in other words, would benefit everyone. But, as TRUST South L.A.’s Harris noted, just focusing on the infrastructure on the street is not enough. The neighborhoods along the Crenshaw corridor are undergoing a tremendous transformation at the moment. The construction for the rail line has created significant upheaval and uncertainty along the business corridor as well as in the housing market. Actively engaging more residents in engineering the corridor’s future landscape — be it physical, cultural, economic, or social — will hopefully ensure more residents are able to benefit from and even harness the change the line is expected to bring. As of now, it is unclear what Great Streets’ plans are for the section of Crenshaw between 78th and Florence. The Street Beats event was the first real engagement the community has seen on the topic, despite it being named one of 15 Great Streets almost two years ago. In contrast, intersection improvements for the program are already going in along Cesar Chavez Ave. in Boyle Heights, even though the community engagement event Nuestra Avenida (put together by the awesome folks at Multicultural Communities for Mobility, CALO YouthBuild, and From Lot to Spot) won’t take place until March 12. 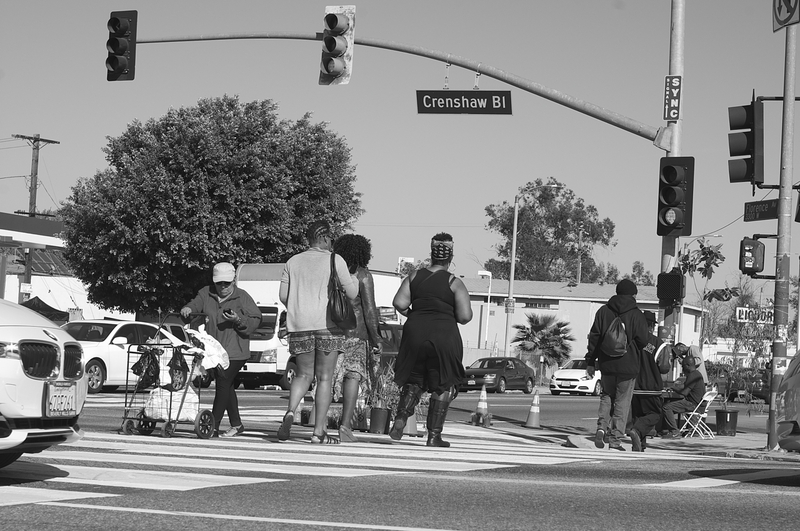 The fact that Great Streets has not yet focused on Crenshaw may turn out to be a good thing, if it means that the community will be able to have more say on the future of the corridor. I know I would certainly vote for having this talented drum crew helping keep people safe (below). What would you like to see? Join some members of the Street Beats team (in collaboration with C.I.C.L.E.) on a short Bikes and Beats ride Saturday morning at John Adams Middle School (details here). 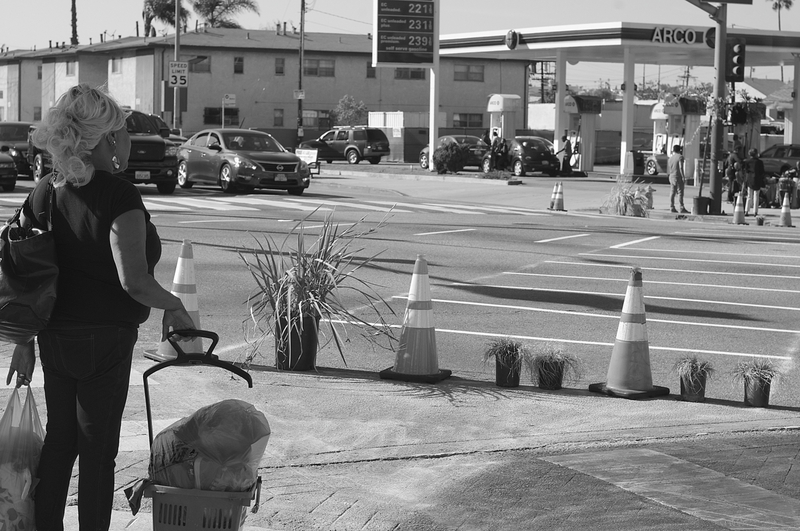 Or check out another Great Streets event on Central Avenue — Youth Envisioned Streets (YES!) for a Healthier South L.A., — featuring A Place Called Home, the National Health Foundation, Coalition for Responsible Community Development, the Los Angeles County Bicycle Coalition, and Los Angeles Walks. Details here.